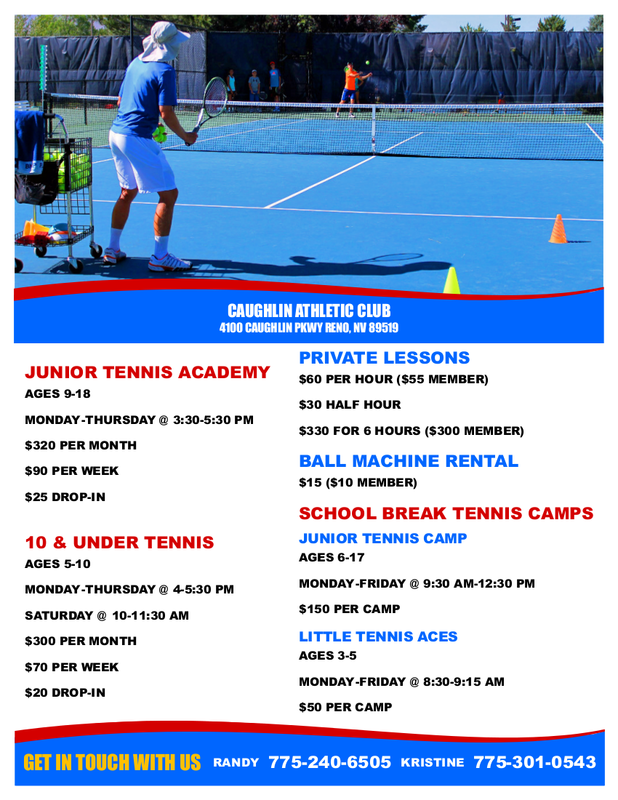 We invite you to join the junior tennis academy at Caughlin Club in Reno, Nevada. At this academy you will hit a ton of balls, work hard and improve your game. The junior tennis academy offers top notch tennis training, a pristine tennis environment, and fun for players, ages 9-17, of all skill levels. TRY OUR TENNIS ACADEMY! GET A FREE DAY! The junior tennis academy is geared toward developing tournament and high school tennis players. Students improve mechanics for all strokes, footwork and conditioning. Focus is on consistency and improved shot making. Group tennis instruction and live-ball play are present in each class. For additional tennis information call us at 775-240-6505 we would be happy to help you.